Cosplay can be pretty useful, especially if you use it as misdirection. 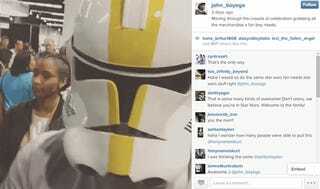 And that’s exactly what John Boyega, star of the upcoming Star Wars movie, did at a convention recently. As The Daily Dot writes, Boyega was at the Star Wars Celebration last weekend...as a Clone Trooper. Nobody noticed! Ha. What good shenaanigans. Between this and Bryan Cranston at Comic-Con, I’m now going to be paranoid about the possibility that the people in masks at conventions are actually all famous stars. One can dream!